Technology design firm Witti has made a sound dock alarm that teams up with your iPhone so that you can control your whole house without having to leave the warm surroundings of your bed. Beddi will be programmed to be compatible with your Nest device, so you can control the temperature of your house, it will also be compatible with Phillips Hue so that you can even change the lighting in your house. The dock will also be compatible with Siri so that you can even have a good old natter to your alarm clock before you head to sleep, or if sleeping isn't on the agenda speak to Beddi to order you a cab through Uber. “Beddi helps you get out of bed and start your day on a positive note. 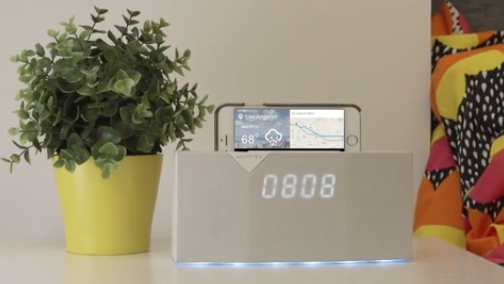 As smartphones replace traditional alarm clocks, Beddi combines the functionality and flexibility of a smartphone with the added benefits of smart home controls right from your night stand” said Witti CEO, Alfred Wong. Beddi isn't going to burn a huge hole in your wallet either as you can back the product now for $75 (£49), or wait until release that will retail at $99 (£65). Currently a Kickstarter project, the Beddi Alarm clock hopes to begin production of the clock by May of next year, providing it gets enough funding.